Back of card: Symmetrical. Against a red field, the risen Christ appears in an irregular shape. This is repeated, upside down, on the lower half of the card. Has the same red border as the front of the cards. Booklet included: Yes, two: One in English, one in Italian. Each a long folded sheet of 14 panes. Each pane measures 2.6 x 4.75 inches, or 66 x 120 mm. Includes one rather messy-looking Orthodox Cross layout. Comments: This is a Russian Orthodox Christian tarot deck. Orthodox icons & iconography date back to the founding of Christianity. For centuries the Church fought to distinguish between veneration of icons (profound respect or reverence) and adoration (worship, eg, asking the deity behind the image for personal favors). This came to a boil in the Iconoclastic War that broke out in 730, ending with the Council of Constantinople of 843. This defined icon worship from that time to the present & partly accounts for the pre-Medieval artistic style of Russian icons. The cards show scenes from the life of Christ (Christ as the Magician, raising Lazarus from the dead), scenes of religious worship, saints & other Church dignitaries. While the notes identify the various saints shown on the major arcana & pip cards, the faces on none of the court cards - knaves, knights, queens & kings - are identified. Lavish use is made of gold foil, which increases the price somewhat. If you're curious, the gold on the cards is real gold. Among gold's various properties is that it can be hammered extremely thin, and that it never tarnishes. Which makes it ideal for decoration of all kinds. The edges of the cards, however, are not gilt. This is the first gilt deck I've seen that scanned well. So as not to offend the precepts of the Orthodoxy, Atanassov avoided reproducing the "acheropitus" images, that is the icons which are said to have appeared miraculously without human intervention. In any case, the vastness of the sacred art of the "Eastern Christians" allowed him to create a work of great artistic, documentary, and mystical value. 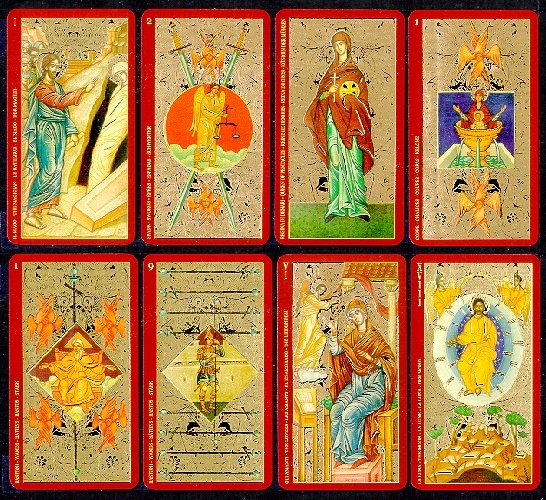 In effect, Atanassov did not reinterpret the Tarot or modify the icons, but rather adapted the Tarot to the icons by associating the traditional meaning of each card to a biblical subject or the portrait of a saint. From this unavoidable choice, which radically transforms Tarot figures, come new interpretative possibilities. In conclusion, the Golden Tarot of the Tsars does not in any way refer to the old Russian aristocracy. On the contrary, these beautiful cards exalt the faith which for a long time fed the Slavonic people; a faith capable still today of satisfying he who searches for authentic nobility in religion consisting of pure & radiant virtues like the gold & silver which shines in the icons.